Martingale collars are designed for dogs that have a tendency to "slip" their collar, especially when on lead, or for dogs with small heads but large necks. "The loop portion is guaranteed because it has a tendency to wear down the fabric. Some dogs are active pullers, others aren't - so send me your old collar and I'll replace the loop every time it wears down to the webbing." 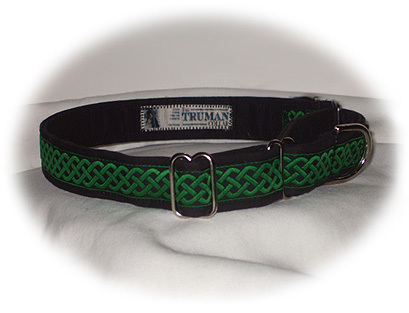 Note: All Truman Collars are available in both Buckle and Martingale styles unless otherwise noted.